An endodontist is a dentist that has undergone specialist training and has completed a three year postgraduate Masters degree in the field of endodontics. They focus solely on root canal treatment and other procedures involving the pulp of the tooth (sometimes known as the tooth’s nerve) or root of a tooth. Because of this additional training they are highly experienced in managing treatment or cases that involve the root of the tooth where this treatment may be complicated or have complicating factors. Your Medland dentist may refer you to see a specialist endodontist if the tooth that is responsible for your pain, or requires treatment, is particularly complex. A case can be complicated to treat if your Medland dentist discovers that the tooth’s internal anatomy is abnormal or difficult to navigate. 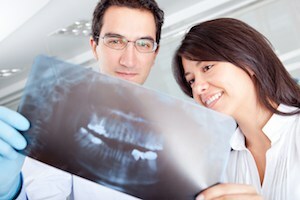 If a tooth has been previously root canal treated, and that treatment has been unsuccessful, we always recommend referral to an endodontist as there are likely to be areas of the root canal system that has been difficult to navigate or clean and would greatly benefit by having an endodontist investigate and treat under a microscope. These teeth may also require microsurgery to address the infection. You may also be referred to an endodontist if your tooth has developed any form of root resorption. Root resorption is caused by your body’s own cells attacking the tooth and “eating” away the root which if left unmanaged, will eventually cause loss of the tooth. You may also be referred to an endodontist to manage the associated complications of traumatic injuries to teeth, especially traumatised front teeth in young patients, or to assist in diagnosis of orofacial pain that is difficult to diagnose.